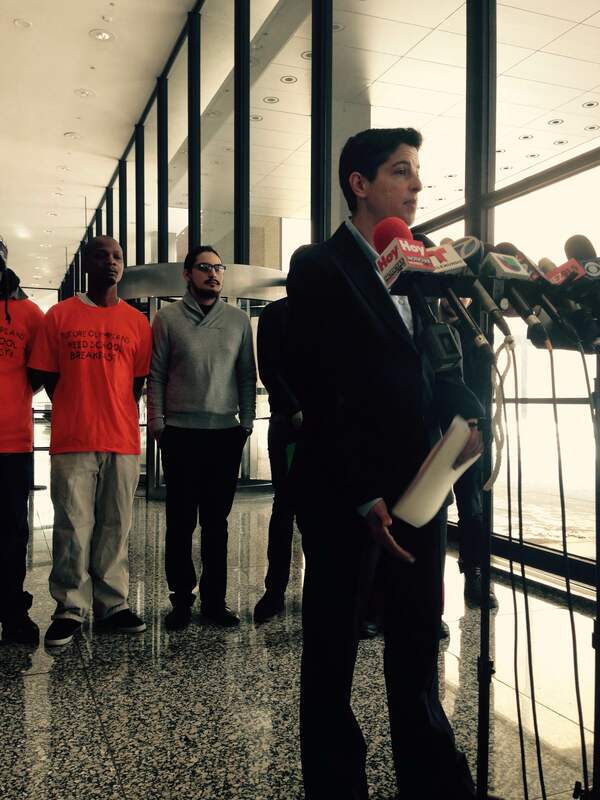 CHICAGO – Today, Grassroots Collaborative held a press conference announcing the filing of a civil rights lawsuit against the City of Chicago and Chicago Police Officers responsible for the false arrest of Felipe Hernandez and Kevin Tapia and the evisceration of their First Amendment rights. 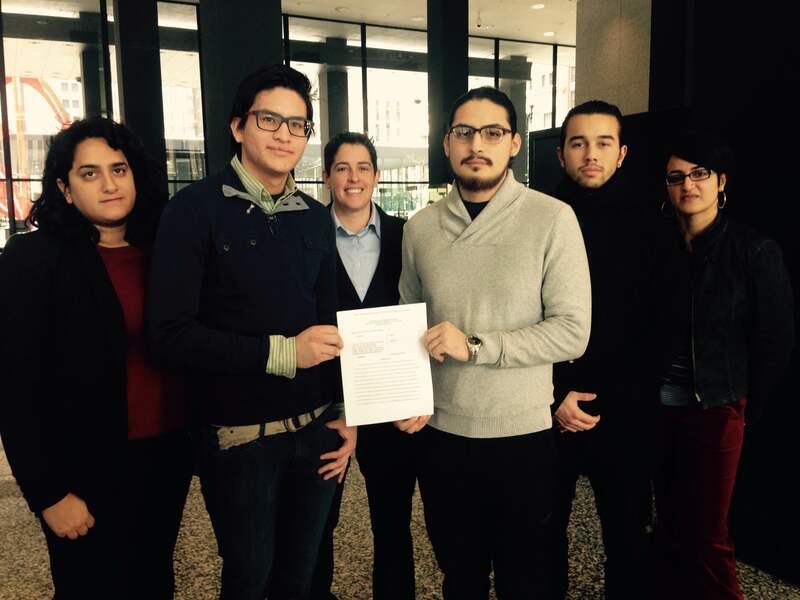 On March 25th, 2014, Felipe Hernandez and Kevin Tapia were door knocking to inform residents about the March 31st deadline for the Affordable Care Act when they were stopped by Chicago Police Department officers, detained, searched multiple times, and questioned. Despite complying fully with the officers and providing their supervisor’s name and contact information, they were falsely arrested and frivolously charged with unlawful solicitation of business in violation of the Chicago Municipal Code. After being booked and detained for several hours, they were released and the charges were later dropped. The lawsuit was filed just a few weeks before the Chicago Municipal elections on February 24th, 2015. “Door knocking campaigns play an important role in our civic engagement work and the work of many organizations across our city. It’s the right and duty of citizens of a democracy to talk to our neighbors and fellow residents. It’s our hope that many Chicago citizens, including young people of color, will be exercising that right in the next few weeks. We are very pleased that Kevin and Felipe have decided to file this lawsuit now. We will continue to stand with them in support of equal treatment and protection of all of our constitutional rights,” said Amisha Patel, Executive Director of Grassroots Collaborative. “I wanted to file this lawsuit because what the Chicago Police did was wrong and I don’t want what happened to me to happen to other youth of color, or anybody else trying to exercise their constitutional right to free speech. Our mere existence should not be deemed suspicious or criminal. Nobody should fear getting arrested for talking with other residents about issues they care about,” said Felipe Hernandez to a crowd of community supporters. Data demonstrates that people of color are disproportionately arrested and charged by the Chicago Police Department. In 2012, Black and Latino youth aged 17 and under were the target of 96% of CPD arrests. And while Black youth bear the brunt of this racial profiling, and are 10 times more likely than their white peers to be arrested, Latino youth also suffer disproportionately, and are twice as likely as their white peers to be arrested. Kevin Tapia and Felipe Hernandez look forward to having their day in court.